It's (just about) that time! 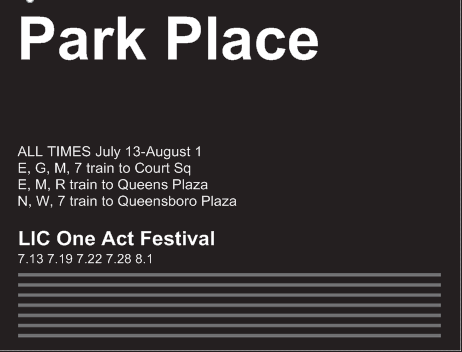 Park Place opens this Friday, July 13th (good luck!) at 9pm at The Secret Theatre in Long Island City, Queens. Thanks to the funky showtime, I can make it after work, so I will be there if you'd like to say hi! Tickets for Friday or any other show date can be purchased here. However, I've realized after fees and whatnot, it's actually $1 cheaper to purchase your tickets at the door! If you want to thank me for that hot tip, you can donate that dollar I just saved you (or more) to our fundraiser, which ENDS Friday! Donate to our indiegogo campaign HERE to support working theatre artists. All funds raised go to pay for rehearsal space, costumes & props, promotional materials, and most importantly stipends for the actors and creative team. So if you have a dollar or two or twenty to spare in the next couple days (deadline is Friday the 13th!) please check out that link and give what you can. On behalf of the whole team, we very much appreciate your support.